Oh how fortune throws a good hand every so often. When I first saw the tour dates, it stated that Seattle was sold out – BOOO! BUT, by a lucky rare chance I caught a last minute wave of final tickets! I was seriously considering driving four hours away to Vancouver, BC because they still had tickets available. Anyways! 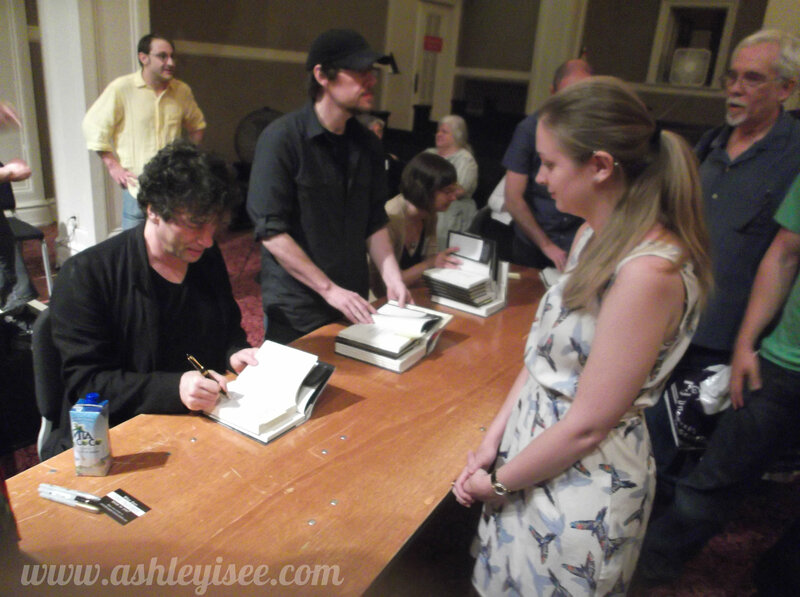 I was super excited, I mean this was an evening with Neil Gaiman! 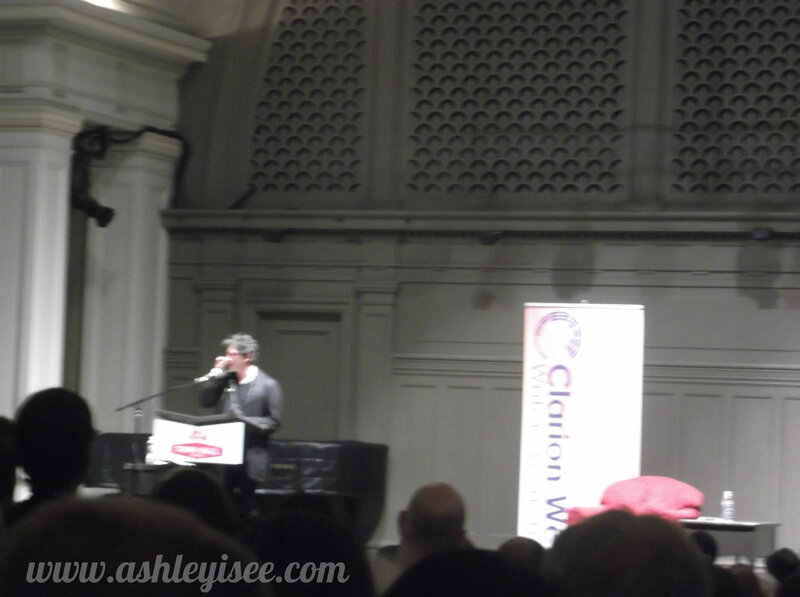 Hosted through the University Bookstore as a part of the 2013 Clarion West Writers Workshop readings at Seattle Town Hall. 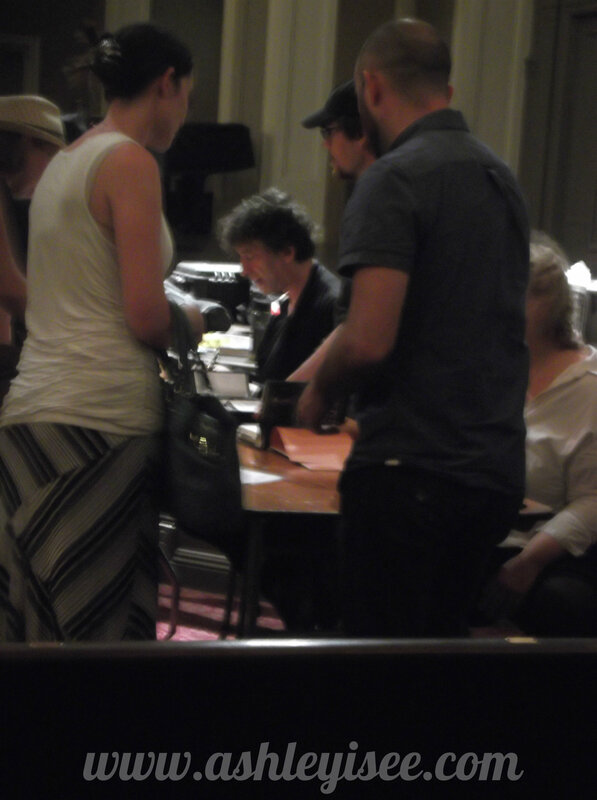 I was one lucky girl to be a part of a huge crowd entertained by Gaiman. First he did a reading from his latest book, The Ocean at the End of the Lane. 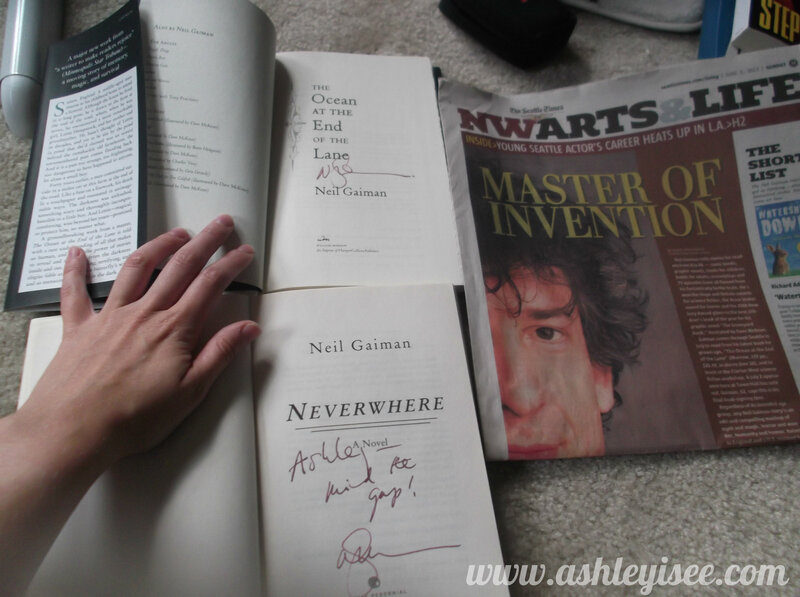 The favourite question of the evening was, “Will Neil ever do a spread for Playgirl?” Gaiman’s answer, “I’m 52!”. Gaiman stated he’d be the God of extended deadlines. Very well said! After the Q & A Gaiman did another reading of a short story inspired from one of his earlier works, and it was just delightful! Sigh. Gaiman is SUCH a trooper. 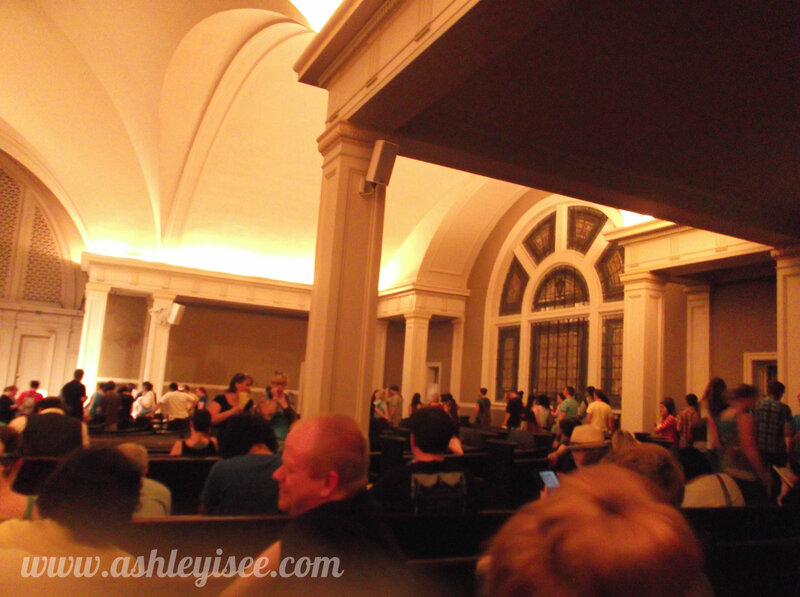 I had gotten to the event just as it was scheduled to start, meaning I missed out on snagging a prime seat. Instead I was in the group of last 50 people to get items signed. There was a long queue. Once you made it to the lobby though, there was a last chance to buy any of Gaiman’s books from the beautiful display. I believe he started signing just before 9pm, by the time I got to meet him it was 12:20pm. He is lovely. So kind, sweet and engaging. I was very nervous and tried not to say much because I was tired, which mean he must surely be more tired and he still had a load of more people to sign things for. I shook his hand, thanked him for a lovely evening and then went on my way. Oh Neil, if only you know how well I can mind that gap. If you have the chance to meet Neil, DO IT, opportunities like this are rare and take advantage! 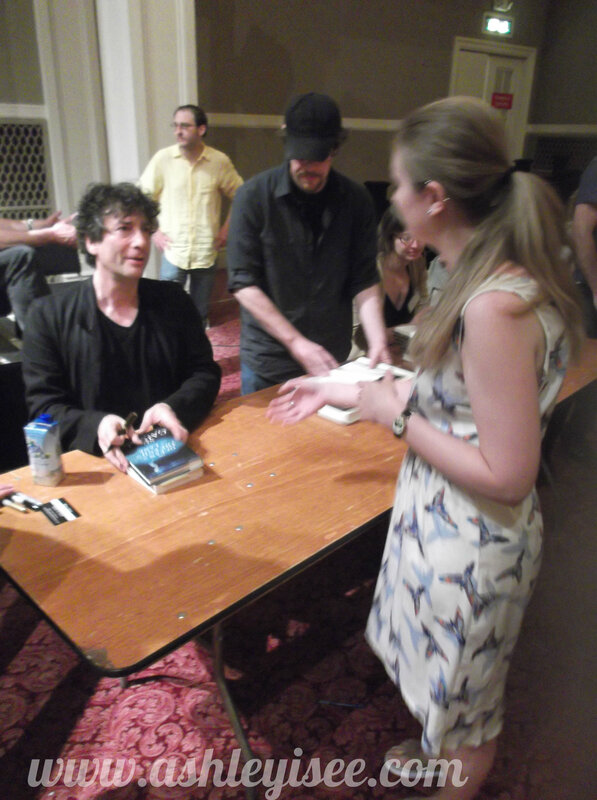 Gaiman knows how to put on a show and he’s delightful to listen to and learn from. For those in Seattle, there are four more evenings of science fiction and fantasy from Clarion. Please check out their site and go. They’re on Tuesdays at 7pm. I hope the unicorns win! I’m jealous. I’ve now watched his commencement speech at the University of the Arts on youtube. So inspiring. Determined to revisit Gaiman, perhaps American Gods or Coraline, might even see if Neverwhere with James MacAvoy is still on Radio4 archives. Did you catch it when it was on? 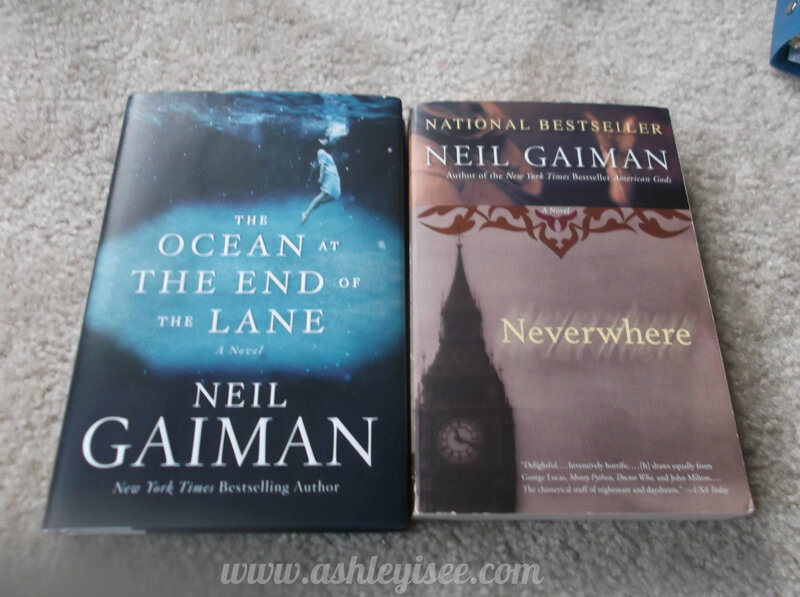 What happened to your first attempt at Neverwhere? 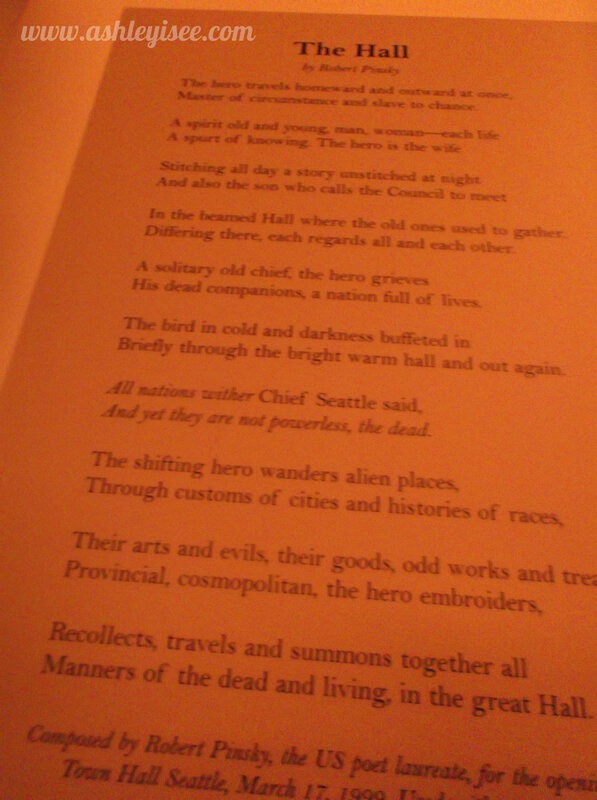 The Border Agency is what happened to my first attempt at Neverwhere. When you have pack up your life in a manner of hours, I couldn’t bring everything home.